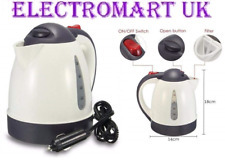 NEW 0.5LITRE DUAL VOLTAGE SMALL ELECTRIC TRAVEL KETTLE IN WHITE COLOUR 2 CUPS ITEM DESCRIPTION / FEATURES / SPECIFICATIONS ---Comes with two plastic cups (slot inside kettle for easy storage) ---0.5 litre capacity (500ml) ---Perfect for holidays, caravans or an emergency back up at home. ---Boil-dry protection ---On/off indicator light ---Dual voltage: 110-120V/220-240V 650w ---Comes with user manual ---Corded 3 pin plug --- Free U.K. Deliver. 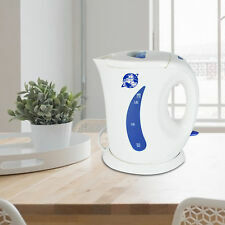 Cordless detachable jug kettle. Pilot light & auto switch off when water boils. Transparent water level gauge. 0.4L Capacity. Boil Dry Protection. 1 water kettle. Baby food stand with spoon and fork included. 1 spoon(inside handle). This heater is a convenient solution for keeping your drinks warm at your desk, in your car, and in your office. Simply plug into cigarette lighter socket. 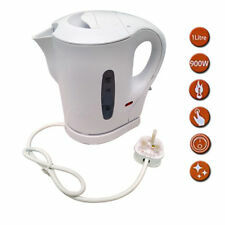 This 12v Electric Kettle represents great value for money combining quality and functionality at a cost effective price. - 1 Litre Capacity. - Auto Off. Here you?ll find the latest and greatest products. 24V Travel Kettle a portable 24v travel kettle which features a soft touch on/off switch with indication light and auto off - dry boil protection. 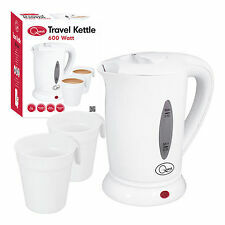 24V Travel Kettle 1 Litre. 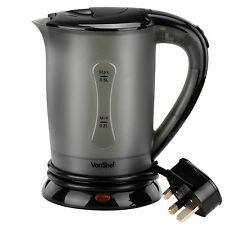 Portable aqua 24v travel kettle. 1 water kettle. This heater is a convenient solution for keeping your drinks warm at your desk, in your car, and in your office. Simply plug into cigarette lighter socket. Baby food stand with spoon and fork included. On/off indicator light. 0.5 litre capacity (500ml).